Marjorie and Bill Nelson are the type of people that any community would be proud to claim as citizens. Actively engaged in an incredible scope of community projects, clubs, good works and institutions, this Burlington couple is also disarmingly modest about their generosity. Yet the impact of the Nelsons’ donations can be felt throughout Hamilton and Burlington. And the cornerstone of their philanthropy is Hamilton Community Foundation. Bill, a retired chartered accountant and business owner, was chair of HCF’s Board in 1990-91 and saw first-hand how the Foundation benefits all sectors of the community. He also knows the Foundation needs to be properly resourced in order to do its work well. Since the late 1980s, the Nelsons have been building their Administration Endowment Fund, which now totals $100,000, to help cover the costs of operating HCF. “We’re happy to see some administration costs get covered through our endowment, because it means other monies can go to their many community projects,” Bill says. Marjorie and Bill also enjoy the convenience of a Flow-Through Fund at HCF, which they started six years ago to benefit the wide range of local charities they like to support, including Bill’s Rotary Club, their own church, United Way, McMaster University, Mohawk College, Royal Botanical Gardens, YMCA, YWCA, local hospitals, the arts and a number of social service organizations. The flow-through Fund allows a donor to receive a full charitable tax receipt for the fair market value of an asset in the year it’s given to the Foundation. 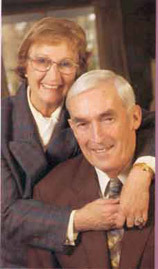 The Nelsons’ gift of marketable securities gave them a significant tax saving. Each year they select the charities to support and send a list to the Foundation for distribution of the funds.